Located in the west of Paris, close to La Défense and Roland Garros, the Novotel Suresnes Longchamp hotel offers spacious and comfortable rooms renovated in 2017 and easy access to the heart of Paris! The Novotel Suresnes Longchamp hotel is located 15 min from the heart of Paris and the Champs Elysées by RER A or the Metro, which departs from Esplanade de La Défense. The hotel is 10 min from the T2 tram at Gare de Suresnes Montvalérien. Reach the hotel from the ring road by following the banks of the River Seine, 10 min from highways A13 and A14. There are bus stops next to the hotel, which will take you to Porte Maillot conference center (bus 244), Porte d'Auteil (bus 241) and La Défense (bus 144). Paris, the capital of France, gastronomy, fashion, festivals, culture, romance and more. Make the most of your Parisian experience by staying at the Novotel Suresnes Longchamp hotel in its pleasant, green setting. Renovated rooms! Come and enjoy our new rooms now! 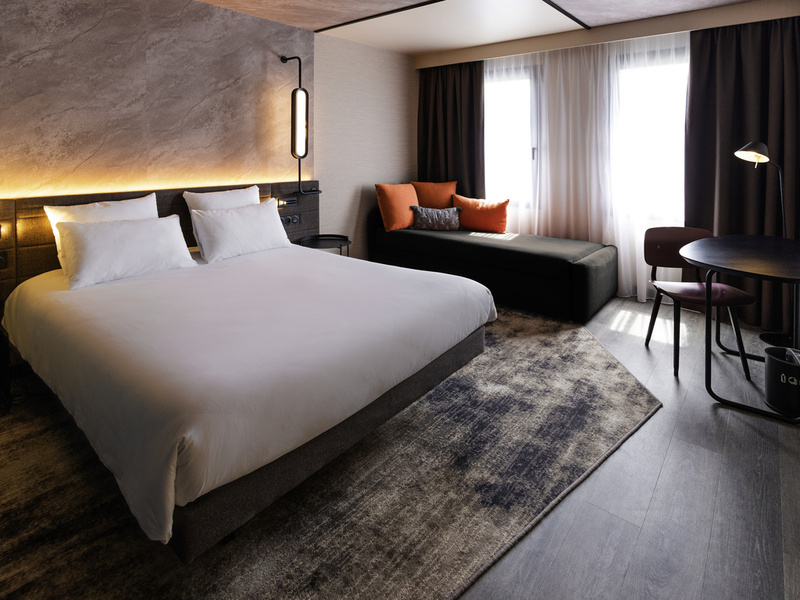 With a contemporary and completely modular design, the spacious, air-conditioned Novotel room is a real living space and can be adapted to suit all requirements. The Novotel Paris Suresnes Longchamp hotel's 112 rooms measuring 269 sq. ft. (25 m²) include free WIFI, tea and coffee making facilities and a flat-screen TV. For even more comfort, choose a suite and enjoy the VIP treatment: separate bedroom and living room, robe, slippers, Nespresso coffee machine, free minibar and 2 flat-screen TVs. In need of a tasty snack? Our chef whips up fresh, colorful, seasonal dishes at the Novotel Café! You can also treat yourself to our selection of wines, or order from the bar menu at any time. New decor in the bar! Enjoy a brightly lit open-plan space that is ideal for relaxing in a friendly ambiance. Whether it's for a business meeting or a drink with friends, everything comes together for an enjoyable time. Rooms are clean, service is excellent and the staff is very friendly. Dear VELIMIR, We very much appreciate your comments regarding your stay at the Novotel Paris Suresnes Longchamp. It is always a pleasure to receive positive feedback. I will share your comments with our team. It would be great if you took the time to write a short comment on tripadvisor to value the work of all the team Thank you again and we hope your next visit will be as pleasant as the previous one. Sincerely, Alexis NICOLAS Directeur NOVOTEL PARIS SURESNES LONGCHAMP 01.40.99.00.00. The room was really confortable. I ask to be wake up at 6.30 no one call me to wake me up. After being already 1 hour late I had to wait 20 minutes to get an elevator. The staff were very nice. They were extremely helpful with directions. The facility needs to be updated. Staff were helpful and unobtrusive. Rooms were clean and appealing, breakfast was excellent. I came from Lahore for one night stay with one objective in mind ; to get at least 8 hours sleep before moving to another hotel for a week long Global GM meeting . Guess what I slept for more than 8 hours and felt fresher more than ever . Thank you Novotel. Room: Shower head was broken. Didn't stay up without sliding down and falling. Temperature: Although my temperature gauge was turned all the way down, my room stayed hot all night and I was sweating when I tried to sleep. Very comfortable hotel. Great service. Eggs at breakfast weren't great and room was a bit cold (hard to increase the heat). The room was ready when I arrived. The staff both at the front desk and the restaurant were friendly and helpful. My only complaint is I have yet to receive a copy of my bill via email. I checked out very early (4:30am) and was told it would be emailed; it hasn’t been sent to date. I still need a copy for my business expense report. Please address this. Booked my hotel, arrived and the waitress telling me they can't find my reservation even i shared my confirmation number. End up telling me it has been cancelled because my card did not go through... I mean how can you cancel someone reservation without sending him an email? While there i could not find a room for my entire stay because it was sold out. I was just able to stay 1day and then i had to book another hotel. I mean this is a non sense i cannot understand! Unfortunate construction during the day on check-in. Also, only one elevator. Aside from construction and elevator out of service, the room was clean and comfortable. It was a pretty nice experience but could have been better. The rooms and the facilities were very nice. Even I liked the room service when I compare it with other hotels I stay in. But the lifts were not working properly and it takes a lot of time waiting for that. Also, the room heating system could have been better. One of the elevators was not working for the entire stay which resulted in long waiting times for the remaining work elevator. Hotel was great but far away from metro/underground line unfortunately so for people who come only for day to see few main attractions it was not the best choice.